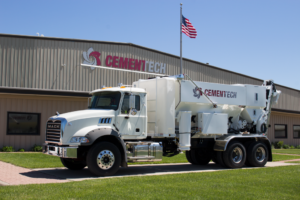 Are Volumetric Mixers Better Than Drum Mixers For Producing High-Quality Concrete? A hotly debated topic, concrete contractors usually split into two camps — volumetric mixers versus drum mixers. While both types of mixers produce the same result — fresh concrete — how it’s produced varies depending on which mixer type is used. In 2011, Terracon Consultants, Inc. performed a comparative test of concrete produced by volumetric and drum mixers, with the focus on mixing and delivery efficiency. The testing was performed for the Volumetric Mixer Manufacturing Bureau with Custom-Crete, a Texas-based concrete producer and supplier. The testing used three concrete mixes made from two volumetric mixers and one drum mixer for two separate, pre-determined placements. Four ACI-certified technicians performed and oversaw all work. Terracon was responsible for sampling and field testing the samples for air content, unit weight, and slump. Custom-Crete handled batching, mixing, and placement of the ready mix at its Houston, Texas facility. The concrete making materials for both mixes used the same sources, except for a water-reducing admixture. Each batch was divided into quarters, with each quarter used to cast one set of six cylinder samples. The first placement sampled each mixing method. The second placement accounted for the use of the water-reducing admixture in the drum mixed concrete and one of the volumetric mixed batches. Both mixing methods were also required to have a similar water-cement ratio in the second placement. The compressive strength of concrete for the three samples tested at 7, 28, and 56 days. At 28 days, concrete produced with a volumetric mixer was 200 psi to 300 psi higher than drum mixed concrete. However, the gap in compressive strength shrunk to less than five percent difference by day 56. To learn more about the comparative testing results, click here to read the full white paper.